Ailsby Collection: The Nasjonal Samling Party Badge. The Nasjonal Samling Party Badge. Rikshird, Unghird, Guttehird. The Nasjonal Samling Party Badge - Youth grade - Obverse. The Nasjonal Samling Party Badge - Youth grade - Reverse. 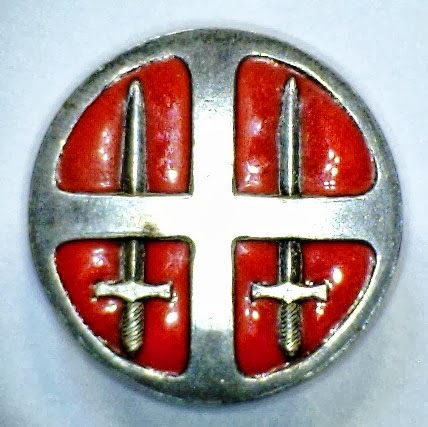 The Party Badge was circular with a diameter of 25 mm and comprises of the ‘Sun Eagle’ symbol of the Nasjonal Samling, being a circular gilt-edged red enamel disc bearing a gold cross with a double edged sword on either side of the central arm, this was given to the Rikshird who were 18 years and older. The youth badge in silver was given to the Unghird 14 to18 years old. The child’s badge in bronze was given to the Guttehird 14 years and under. The reverse was flat with at the top the member’s number engraved. 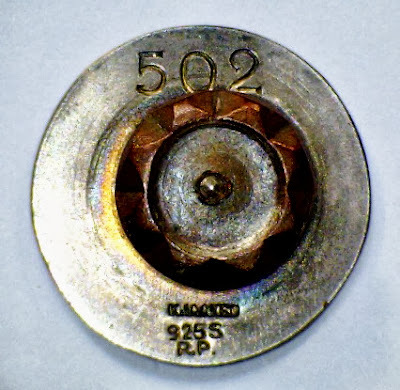 At the centre was a screw post which had a circular button for attaching to the uniform. At the base was stamped in three lines, KIAAKSO, 925 S, and R.P. These badges were awarded to members of the Nasjonal Samling party who were very active. The badges were accompanied by a citation.